We hit the Bull Run Festival of Lights for the second year this year, and I wanted to pass along a few notes and tips. The Festival of Lights runs through January 8th from 5:30pm to 9:30pm on weeknights and until 10pm on Friday to Sunday and Holidays. Prices are per vehicle ranging from $15 (cars weekday) to $30 (van weekend) with separate prices for group buses. You can get a $3 off weeknight coupon by visiting the trash cans at your local Chick Fil A 😉 Sounds weird, but hey, $3 off is $3 off!! The coupons are sitting next to the placemats at the Woodbridge location. Before you get to the park, which is 10 minutes from the Manassas line, be sure you stop at 7-11 and pick up some treats for the car. 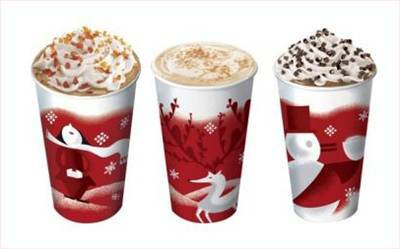 We vote hot cocoa and cookies, but you can pick whatever you like. When you get to the festival, you start out going through a toll booth. It looks like the show is going to start just after with lights on either side, and you may be tempted to turn your headlights off at this point. Wait. They’re just playing with you. There’s 2 light displays and then nothing for a few hundred yards. When you get to the sign that says “please turn off your headlights”, however, TURN THEM OFF!! There’s more than sufficient light from the show and having cars (especially behind you) with their lights on totally ruins the experience for everyone! Winding slowly through the next 2 miles, there are a bunch of cool light displays including reindeer and Santa, the characters from the Wizard of Oz, Toyland, and our family’s favorite- a corner turn where the lights cascade down like snow. The lights are beautiful, and it’s a great activity for an evening where it’s far too cold to enjoy something outside, or if your kids are too little to really enjoy outdoor activities. True story, the first time we went to a light show like this (it was in another state), we had a 1 month old baby and hadn’t been out in months, so hubby and I stopped at Starbucks and put our colicky baby in the carseat, and by the time we got to the lights the baby was knocked out from the wonderful repetitive motion of the car and it was snowing lightly- it was actually one of the most romantic dates we’ve ever been on! So. A word of caution. At the end of the Festival of Lights there is this hot mess. I think they call it “The Winter Village”. Your payment to the light show includes free admission to the Winter Village!! Squee! Free Admission. Don’t do it. Just don’t. The Winter Village is actually a carnival designed to make sure you spend at least $75 on going to look at lights. Rides require tickets (which are non-refundable) and range in price from $3-$5 a ride. Some of them you can squeak by on without getting burned too badly (kids ride free with paying adult on rides they’re too short to ride alone- i.e. 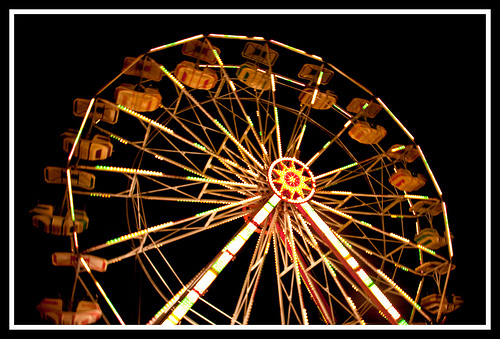 the Ferris Wheel and the Egg Scrambler). You can get a wristband for $18 per person (for our family of 5 there was NO way I was doing that). There’s also lots of junk food around to tempt your kids who, despite the fact that you just fed them dinner, now have a fever and the only prescription is chili cheese fries for $7.50. The Village will be open from 5:30 pm – 10:00 pm in December per the following schedule. 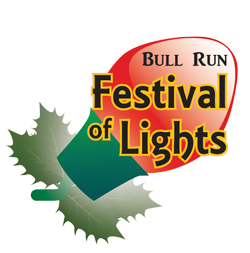 All in all I would say that the Bull Run Festival of Lights can be a fun family outing. For the best value, go with a friend who has a van on a weeknight 🙂 Then you can split the $12 cost with your CFA coupon! To not go crazy and not spend too much money, avoid stopping at the carnival at the end, but if you have it in your December budget, the kids will definitely enjoy a ride or two.